My poetry books all go in the yellow bookshelf. I’m in the process of alphabetizing the books, and books yet to be alphabetized are still sitting on top (sigh). 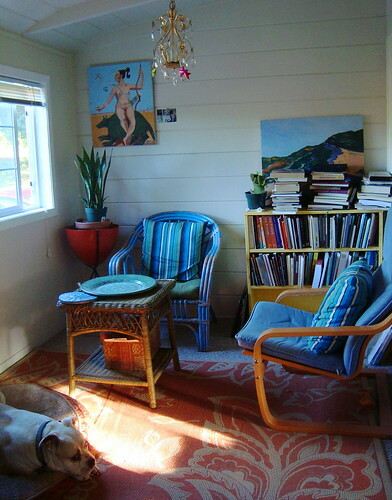 The painting on the left is of the goddess Calafia, by Cruz Ortiz Zamarron. She sits astride a giant armadillo. The partially obscured painting of Hurricane Point, Big Sur, is by me. That’s Gracie, lower left. The oar end of my non-poetry bookshelf. These have all been alphabetized. The ink drawing of the thistle is by me, circa 1979. 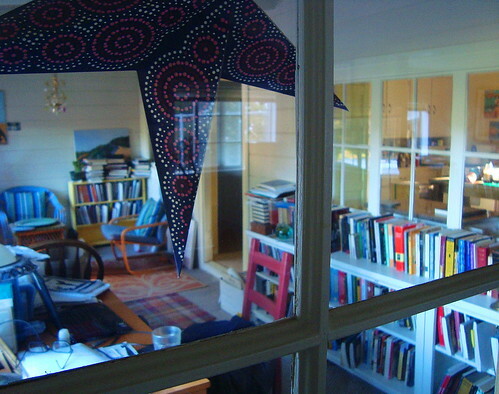 A view of the room through the livingroom window (An interesting aspect of my house is that there are windows set in several of the inside walls). 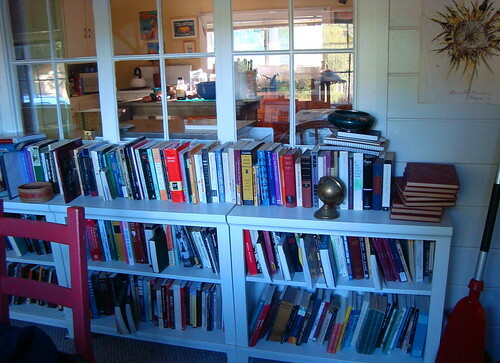 I have another bookshelf in the livingroom, but will reserve that for another time. Previous “Can the subaltern tweet”? My books have been a hodge podge for most of my life, and I too had a mostly good memory for finding things. Maybe my memory is less reliable nowadays, I don’t know — but just a couple months ago I decided I was tired of using my intuition to find my books and decided to alphabetize. It was a very satisfying little project, although it felt very unlike me. But then, who the hell am I? I’m not so sure these days. Will this affect how I go about structuring my poetry and prose now? Time will tell…. wonderful, photos, thanks for posting them. my own books are rather a hodge-podge without any sort of system or classification of order. poetry books sit beside pulp and pop and movie guides and so on. funny thing is that i have a pretty good memory and know where nearly every volume sits no matter how haphazardly it is dis-organized on the shelf. i don’t perhaps how we organize, or don’t organize, are an outward manifestion of the structures of our own thinking selves?